Everyone in the industry is loving it. “The environment for us right now compared to where we were at the end of last year is dramatically different,” CSX CEO Jim Foote said Tuesday evening, when the railroad reported that earnings had jumped 72% from a year ago on a 6% revenue increase. “In terms of the pricing environment and the capacity environment, it’s a good time to be in the railroad business,” he said. The day before, trucking company J.B. Hunt reported that revenues rose 24% year-over-year and net income 7%. It attributed the surge in revenues to higher shipping volumes, the prices it has been jacking up in response to the demand, and an improved freight mix. Container imports at the ports of Los Angeles and Long Beach, the largest ports in the US, rose 8.4% year-over-year in June. Typically, about 70% of their container imports are from China. Container imports at the Port of Oakland, which also gets a large portion of its imports from China, jumped 8.7% in June. This is especially true in the Dry Van and Reefer (refrigerated) marketplaces of trucking, while the Flatbed segment of trucking is continuing to struggle with productivity since the adoption of ELDs. 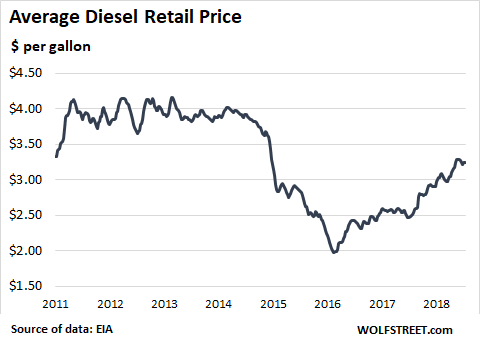 Flatbed spot prices, excluding fuel surcharges, jumped 26.7% year-over-year in June, and contract prices rose 10.5%, according to DAT. On top of this, fuel surcharge soared 60% year-over-year. 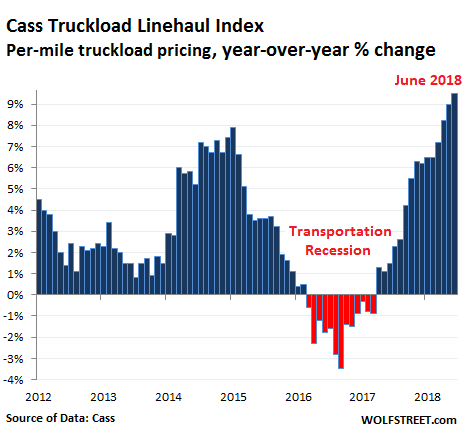 This increase in the index “clearly signals that capacity is tight, demand is strong, and shippers are willing to pay up for services to get goods picked up and delivered in all modes throughout the transportation industry,” Cass said. Prices for “intermodal” freight have spiked. Intermodal involves a combination of several modes of transportation: in the continental US, mostly truck and rail, such as a container hauled by truck to an intermodal facility, loaded on a train, and at the destination transferred to a truck for final delivery; or a trailer piggybacking for part of the trip on special rail cars. 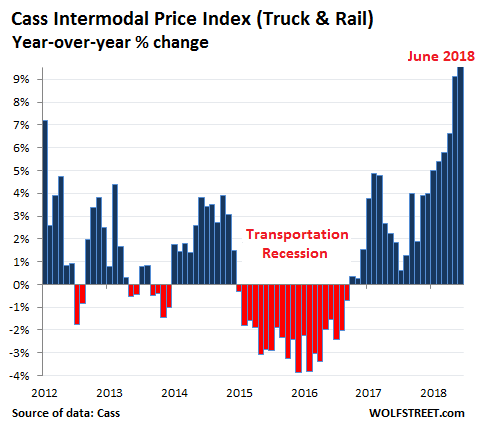 The Cass Intermodal Price Index, which includes fuel prices, jumped 10.9% in June compared to a year ago, the 21st month in a row of year-over-year increases, and the sharpest year-over-year increase since August 2011. 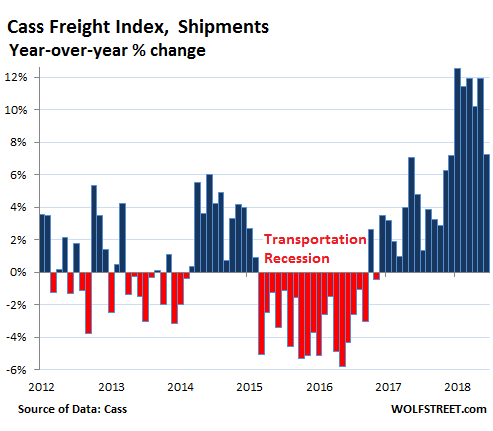 Transportation – trucking in particular, but also railroads – is an infamously cyclical industry that suffered through the “transportation recession” from 2015 through much of 2016, when the goods-based sector in the US slowed down, inventories were high, and demand from shippers fell sharply. 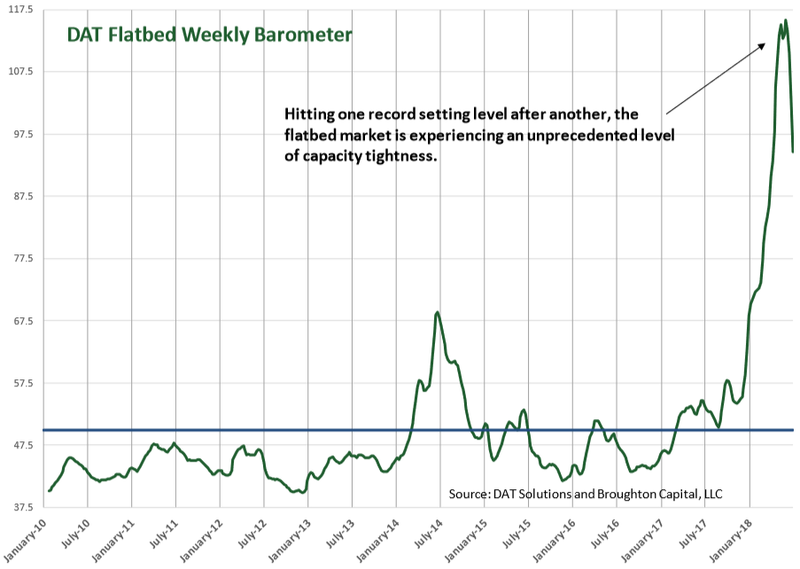 With impeccable timing, it came just after the industry had invested in capacity additions. Excess capacity reigned, and prices fell. Now, once again, euphoric trucking companies are building capacity to meet demand. This has led to record orders for new Class 8 trucks that exceed the capacity of truck manufacturers that two years ago were laying off workers. And so the cyclicality of the business continues. What will it take to smoke out Fed doves? It’s becoming clear that they left tightening too long. You can descend so slowly in search of a soft landing you run out of runway. I know this is not the place to look for sympathy for the Fed, but just when it looks obvious what they should do, a trade war looms. Breaking news: just now a Trump tweet critical of Fed for raising interest rates. So much for the promise to respect Fed independence. No doubt given the contempt for the Fed hereabouts some will cheer this opening salvo. Out of the frying pan into the fire? It came out a while back that the man values “loyalty” over all else. He has no concept of checks and balances, or even of someone who’s loyal playing Devil’s advocate and exposing him to points of view other than his own. So yeah, do what’s best for the economy and if Trump thinks it’s not best for Trump, you’d better have another job lined up. To be strictly fair, he did end by saying they should do what they think best but speaking PUBLICLY about Fed policy at all by a Pres is almost unheard of. But he didn’t raise rates. Tria is Italy’s minister of finance. The populist government will likely force him out so they can have steep tax cuts etc. delivering tax cuts with more debt instead of unpopular spending cuts. Could these shipments from Asia be an attempt to beat potential trade tariffs ? I’m sure China got wind of the US Gov trade war long before CNN presented it to the American people. Yes, it could be. But I’m not sure to what extent. At first (March), no one was taking it seriously. It was just vague talk. By June, it got pretty serious. But changing ordering patters isn’t done on a dime. So I think that the trade-war rhetoric could have something to do with part (maybe only a small part) of the surge of containers from China in June. it could be a rush to build inventory ahead of the slowdown 45 tweeted against the FED “The United States should not be penalized because we are doing so well. Tightening now hurts all that we have done. The U.S. should be allowed to recapture what was lost due to illegal currency manipulation and BAD Trade Deals. Debt coming due & we are raising rates – Really?” Trump tweeted. what do you suppose the super stable genius is thinking? China doesn’t order the stuff, Americans do. It would have to be Americans who got wind of it. If the Americans follow Twitter more closely than the Chinese, they may have learned about the tariffs an hour or so before them. China orders lots of “stuff”,especially raw materials and unfinished goods to be turned into high value goods to sell back to us(definition of a third world country/colonialism). What they have stopped taking is our trash(nonclean recyclables) and we will soon be drownding in it. Yes, China does order lots of stuff. The imports to China are ordered by China. But if you read the comments to which I was replying, the thesis is that China had ‘got wind’ of tariffs and was shipping extra to the US. On spec, in rented warehouses, in the hope that US outfits will eventually buy it? Or stuffing the channel. Walmart orders 10K TV’s and China thoughtfully ships them 15K? I don’t think Wally gets pushed around like that. So yes China orders lots of stuff but it doesn’t order on behalf of American importers. They do that. If there was going to be a Chinese reaction to tariffs on their exports it would most likely be a reduction in imports of raw materials. Your story is being repeated millions of time across the US. Unless you are in a small handful of “industries” (tech, entertainment, finance), or a high level executive, it’s not worth it to live in the high cost coastal cities. I have relatives that have recently relocated out of CA for this very reason. And we did something similar 20 years ago- MUCH to the benefit of our financial and personal well being. I’m not sure how long this kind of price structure/cost of living in these places can persist. I understand what you are saying, but my issue is that the over-pricing of those “hot” cities tends to eventually spread all over, such that there will no longer be “affordable” places anymore. It has the “feel” of being in the Summer of 2007. Transports were really humming along then to. Up, up, and away! Except for transports, the present day fundamentals are ALL gloomy. Where all this transport enthusiasm stems from is a conundrum. Are we listening to the “Fat Lady” singing her song? Time will tell, however I don’t feel optimistic. More pessimistic. What’s so tough is getting your head around what people believe versus what is actually happening. Wages for all but professional and managerial workers are still flat. The tax cuts overwhelmingly favored the well-off. Yet people (by which I mean the white working class) are buying and spending because they believe that Trump is making their lives better. At least the big boys who own the vast majority of the stocks and bonds really are reaping significant benefits from Trumps tax cuts, spending spree, anti-union actions and judges, and deregulation. But that’s maybe 6-10% of the population. We all know this will end badly, but so long as people believe, or have lots of money and the promise of more, the status quo will hold for a time. James, the economy is not as robust as the Fed, financial MSM or the government report. Much of the rise in corporate profitability since 2009 comes from cost cutting and accounting gimmicks. The fundamentals across the economic spectrum just DO NOT validate the widely held sunshine and lollipops outlook. It’s like watching golf on the television. They only show the leaders, and they focus on the good shots that people make. The losers and the bad shots happen behind the scenes. Where is the money coming from, where else, credit cards. My favorite report. Note that revolving credit (credit cards) debt popped at an annual rate of 11.4%. So even though people payed down some of the spending binge from 4Q17 in 1Q18 we are now back off to the races. Also note the 15.54% being charged for credit card accounts assessed interest. That’s over 1.5% higher than last year. So we are paying 15 billion more in interest per year on these accounts. The well off don’t carry credit card debt because the rates are too high. There is unfortunately a group of people that are going to dig themselves a hole they can’t get out of. James Levy – Ask any white working class person who produces anything and even the most ardent pro-Trump ones are saying things are *not* better. Who’s doing well among the white working class are those who hold stocks. That used to be a contradiction, but these days some awfully working-class people own stocks. A guy I know (not saying a guy I like because he’s an extremely racist, whining a$$hole) is doing great because (a) he didn’t fall for the high-tech scam and spend the years some idiots like myself wasted in college, learning to become a better carpenter/mover (or I think during those years he was driving a truck) and somehow he got into investing in the stock market (probably because for 99% of people, trucking pays far better than high-tech). Another guy I know *of* was voluntarily homeless so he could send money to his daughter, and was/is in the stock market and he’s doing great recently because of this. Myself, I never got into the stock market because I know that just like with any casino, the house always wins and all that money sloshing around came out of the pockets of the little guy like me. Its not just the ELD that is driving up prices, driver shortage and my cost of operating these newer trucks equipped with emissions and sensors are very expensive to operate. Last week one went down in West Texas and Peterbilt said it would be a month before they would look at it, we went to Cummins and three days later with a bill of 5k we were rolling. The shop all over the US and Canada are filled with these trucks and problems with the emissions system, don’t forget I am three days late with a delivery and have to pay a driver to sit in a motel. I have spent 30k so far on emissions problems for this 2013 truck with 665,000 miles. It is a constant headache! To rebuild a Cummins motor today is 25k, 10 years ago a Cat engine rebuild was 11k, Cat no longer builds truck engines for trucks, ever wonder why? Emissions problems! I’m not sure, but I think I remember my father in law getting engine rebuilds for his cement trucks for 5k an engine in Butte MT around 2002 or so. I think they were Cat engines. 10 years ago I could rebuild an N-14 Cummins or a 60 Series Detroit for $3-4,000 in parts and I could do the labor myself. $25K for a rebuild today does not include a new DPF or DOC which could add $10-15K to the amount. I bought my first truck in 1974. My current one is sitting parked, my response to the ELD law, which was the last straw for me. I wish I had more time to talk about this, I’m in the mood to vent, but Calpella to Santa Maria means the Bay Area, which means traffic hell awaits. I am sure of very few things any more, but I can promise that the current high truck rates will not last. There will be a regression to the mean. We seen this movie before. Just about the time all that newly ordered equipment shows up, the next recession will arrive. There’s a reason for all those emission controls. Back in the 1980’s air quality in the Sacramento Valley was so bad that I often couldn’t see the coast range (12 miles away). Air quality is now way better. Children with asthma can actually go outside and breathe. Emissions are a public health issue, and controls are necessary and appropriate. Why does an emissions problem stop your truck? Aren’t you tested only once a year? Do they check your emissions at those weigh stations? Not an expert but the changes in tech required have compromised quite a bit of the longevity and reliability + economy of the engines in order to hit the specific PPMs especially of particulate and varying sulfur byproducts. I’m sure there are others but this is what springs to the top of my head. Similar things happen in the car industry due to the way emissions are regulated. Currently the EPA requires emissions to be calculated on total emissions/gallon vs a more sane emissions/mile. So that is one of the reasons why newer cars have some reliability issues + are significantly less economical than they could be. I’m sure Wolf or another can expand on this or correct me where I may have misspoken. I cannot speak for late-model heavy trucks, but in terms of “cars” (pickups, SUVs, vans, crossovers, and cars), manufacturers have nailed it by now. They have had to build tens of millions of them every year globally for several decades with increasing emission-control requirements, and they have become very good at it. Today’s cars are cleaner and more reliable than ever. The federally required emissions warranty in the US is one factor: warranty repairs are very expensive for the manufacturer (and very profitable for the dealer). Part of the federally required emissions warranty goes to 8 years or 80,000 miles, whichever comes first. For a car, that’s quite a bit. This is in addition to whatever other warranties the manufacturer offers. There are some big differences between how a “car” and a Class 8 rig are used, and they may change the equation, including the mileage put on these rigs and the load on the engine during operation. You read in some of the comments in this section, posted by people in the industry, that a truck with just 600,000 miles on it is in the shop all the time … if you said that about a car, people would laugh out of the room. But for these rigs, that kind of mileage is pretty typical. Last one was produced in 1997.They are indestructible,I sh… you not ! I still see them on the truckstops.Talked with their owners-zero complaints.And Marmon truck with Lipa transmission will last forever or until Sun burns all the hydrogen, whichever comes first. Used to drive Marmon truck myself in the early ’80s delivering frozen meat from Nebraska to New Jersey.It was such fun barreling down I-80 at the sedate speed of 110mph (no one took 55mph speed limit imposed by Jimmy Carter seriously). But I was bored out of my wits doing this and migrated to other pastures (thank God). I work in terminal operations for a Large LTL carrier and we don’t have a truck in the fleet that the check engine light isn’t on. They are so overcomplicated they can’t be fixed by anyone but factory trained techs with factory issued computers(not available to outside shops) and then it can take days/weeks to get it right for a little while(days/weeks) until they fail again. We run them if they start and always have towing contractors on speed dial. We may have equipment but we can’t get drivers. The AOBD automatic onboard logging devices are the latest insult to professional drivers and they have quit or retired enmass. We watched the same thing done in Canada 20yrs ago,drivers were driven out and replaced by third world imports to drive down wages but so many people were killed they eventually had to tighten standards but it was too late and a generation of professionals were lost. Look for any “steering wheel holder” from anywhere they don’t have driving records to be on the roads endangering everyone for corperate greed and bureucratic power. 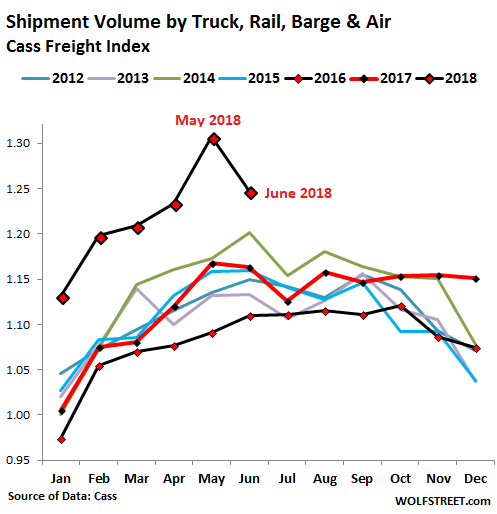 How can it be that shipment volumes (as shown in the chart of the Cass Freight Index) have been relatively constant for six years in a row and then all of a sudden we have a jump in 2018? This isn’t primarily due to the population suddenly consuming more things, is it? Did our exports go up so much to cause the spike? Has the way shipping volumes are calculated changed? They have been anything but constant. Look at the second chart. It shows year-over-year percentage changes going back to 2012. The normal range was between +6% and -6% year-over-year. That’s big for a normal economy! But the outsized gains in recent months dwarf those single-digit changes. During the transportation recession (red bars in the charts), the maximum yoy decline in shipments was less than 6%, and there were all kinds of layoffs. Normally, shipping 4% or 5% more goods than a year ago is very strong. Since 2010, real annual US GDP has grown in the range between 1.5% and 2.8%. So an increase in the goods sector of 5% or a fall of 5% is a big thing. In 2016, during the transportation recession (red bars), US GDP grew only 1.5%, the worst since the Financial Crisis. The service sector, which remained strong, kept the economy out of a recession. Increased complexity in trucks is matched by that in automobiles. Does anybody remember the Saab models 93 and 95 of the1950s? One could remove the hood, stand astride the fenders and lift out the three cylinder, two stroke cycle engine. It could then be traded in for a factory rebuilt motor, for $170. Agree but that is a bit of an odd duck. Let’s up the ante to a really mass production small car that could travel 70 mph all day: the VW Beetle. That could also have a cheap engine change. I’d like to check out one of those Saabs. Never seen one. Probably all of 50hp, the Saab sounds like a real race car for some poor guy down on his luck. Sorta like Messerschmit fuselage on wheels or perhaps the Citroen 2CV race car. That Beetle must have been the high-performance version for the American market (with add-on AC?). My uncle’s VW had 34 hp. Well, maybe a U.S. patent examiner commuting a hundred miles a day in a great-handling, economical, easy to drive car could be called by some a “poor guy down on his luck”. I had the 68 Beetle which I think was up to 1600 CC up from the original 1200. Was quite agile. First one I ever drove I was about 18 on first job and guy sends me to pick something up. It stops halfway there and I look for gas gauge: there isn’t one. I phone guy and he tells me to turn this handle which allows access to reserve gas. Like my motorbike. Even the 68 had some quirks: the windshield washer was powered by the air in the spare tire, not with it’s own pump. A float shot- off prevented it draining the spare which only had to pump out a quart or so. A step up from the foot operated squeeze bulb. Drove a beetle myself, before I switched to Saab. Saab was front engine, front-drive, very staunch body and did not have its gasoline tank placed in front of the driver’s lap, as did the beetle. Both were fun to drive but the Saab was safer, IMO. Yes, but then you probably also had to change out the transmission. When a speck of dirt in the fuel wrecked the motor, you usually also lost the transmission. Saab knew about the the motor and offered free replacements. Having to repeatedly replace transmissions, however, got to be a bit much for my father, on his graduate student salary. The trucker shortage is being driven by: unemployment rates being down, which has created a positive consumer outlook and people buying more goods. It is definitely driven by demographics, “in the past ten percent of drivers were near retirement at any point in time, today it is 25 percent” said Mr. Dewberry. The ELD mandate has had an impact, but perhaps not as big as many argue. But a big reason for the shortage is that “we’ve forced our carriers to drive their prices down. Trucking companies don’t have many levers. There is fuel, carriers can not control that. And there are driver wages. For many years, driver wages were not keeping up with wage growth in other sectors. So, there is a driver shortage. Companies are having a harder time maintaining existing service levels, much less moving to more demanding business to consumer ecommerce type expectations for quick deliveries. “5:00 to 9:00 bleeds over to 9:00 to 5.00″ quipped Mr. Dewberry. By that he means that people go home at the end of the day, order on line, are promised quick deliveries, have choices on when and how goods are shipped, and have visibility to those shipments. Those expectations then carry over to the business environment. It’s a skills shortage at the management level – they don’t know how to raise driver pay. Interesting how the previous bar graph of heavy truck orders and these graphs all correspond to an election result, in the case of the truck orders even showing the very first positive spikes in Nov 2016 and Jan 2017. This corresponds to the sudden business optimism I saw mentioned in a local small business newsletter, specifically identifying the cause – the results of the election. For EIGHT YEARS businesses didn’t know what edict would appear next which was harmful to their business with a prime example being Obamacare. In Jan 2017, they were released. Just did a quick turn around drive from Dallas to Houston and back. To Houston: Walmart, Fedex, and produce/food delivery. To Dallas: mainly flatbeds with pipes and chemical/gas trucks. Also noticed lots of good looking new trucks with no marking so have no idea what they were hauling or if they were being delivered. First time in a couple of years that I have seen fleets of flatbeds hauling those huge blades for wind turbines. Long boring drive that I make often so this is part of my “eye spy” game. Just an observation: People moving to Houston hauling their stuff tied down on a trailer. While those moving to Dallas use moving vans. Types of job opportunities? Which may explain my last two cents worth observation. The line of ships waiting to port in Galveston gets exponentially longer every year. Interesting. FYI: the province of Ontario Canada, the industrial heartland has just elected a conservative gov which just cancelled most alternate energy programs. Over 700 in all. So there will be less turbine blades on the road. Seen them once here on Vancouver Isle. A long load! If freight prices are jumping, it creates a problem for most businesses. It’s not just the new volume that bears the increased freight cost. Rather, the price of all shipments is increasing. Thus, the price of everything goes up. In the goods area, the freight cost is broadly comparable to the profit margin (i.e., freight cost and profit margin may each be 5% of revenues), so a 10% increase in freight equals a 10% decrease in profits, unless the cost is passed on. The goods business must raise prices on everything it sells, or its margins margins evaporate VERY quickly. So you would think nearly all of this additional cost gets transferred to the end consumer. This would not be a problem, in the eyes of the Fed and its beneficiaries, as long as the masses don’t know they are getting hammered by inflation. Perhaps the Fed could adjust the way CPI is tracked to eliminate this problem. I’m sure Bernanke can come up with something at his think tank to justify continued money printing. Another interesting side effect is that the masses pay the price for purchases by the wealthy. 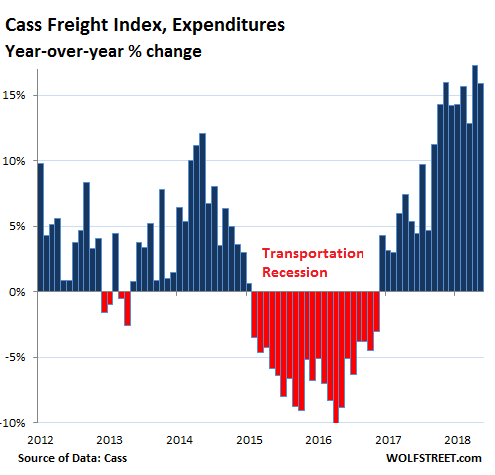 If freight costs are rising across the board because the wealthy are buying more Tesla’s and Gucci belts, the Average Joe pays more for his washer and dryer, thereby offsetting the rich guy’s cost. Freight cost is largely fungible. If this is like other “hard” data it will be based on a “survey”. That typically means that only a few “large” companies, regions or products are sampled…and that, probably, oil and gas will give an unrepresentative growth rate. I simply can’t see much organic growth and non-cheap debt-fed demand out there in the wider economy. It’s is NOT survey based. Cass handles about $20 billion in shipping expenses for shippers of all kinds (except commodities) and uses the data for these reports. This actual shipment and payment data. Just to correct the record, the 55 mph national speed limit was imposed by Pres. Nixon in January, 1974. Railroad volumes keep climbing, both intermodal and carloads. BNSF hauled 220,718 units during week 28, with an average of 1596 trains on line every day. This is near record territory for this time of year.